India Mobile Congress (IMC) is one of the biggest marquee Mobile, Internet, and Technology event for South and South-East Asia, with the theme, “New Digital Horizons – Connect. Create. Innovate.”,IMC 2018 began on a grand-scale at Aero City, New Delhi with over 300 companies, 20 countries participating in this prestigious event in the Asia Pacific region. Shri Manoj Sinha, Minister of State (Independent Charge) for Communications and Minister of State for Railways, accompanied by Shri Ravi Shankar Prasad, Union Minister of Electronics and Information Technology and Law & Justice, Shri Suresh Prabhu, Union Minister of Commerce & Industry and Civil Aviation, Shri Hardeep Singh Puri, Union Minister of State (Independent Charge) for Housing & Urban Affairs, Ministers and dignitaries from Cambodia, European Union, Lao-PDR, Myanmar, Mauritius, Nepal, South Africa inaugurated and participated in this 2nd edition of the epoch marking event, which began in 2017 to build a collaboration platform for technologies and services in next generation mobile communications. The inauguration ceremony was attended by over 5000 people from 10 partner countries, and included policy makers, ambassadors, opinion makers, change agents, bureaucrats and investors. Shri Manoj Sinha, announced that the Indian telecom industry will rollout one million WiFi hotspots in the country by December 2019, which is another step towards the digital empowerment of the nation. Bharat Wi-Fi, a country-wide common inter-operable platform of one million Wi-Fi Hotspots, owned and operated by Telecom Service Providers, Internet Service Providers and Virtual Network Operators will be rolled out across the country. This initiative allows consumers to access Wi-Fi Hotspots of any of the partnering operators. The National Frequency Allocation Plan 2018 (NFAP) was unveiled during the inauguration presenting a pioneering roadmap for the Indian digital communications industry. The NFAP released a quantum of 605 MHz license exempt spectrum in 5GHz band for Wireless Access Services and Radio Local Area Networks in outdoor, to meet the ever-growing appetite for data (from a current figure of 50 MHz since 2007). The NFAP also offered over 30 license exempt bands for Short Range Devices (SRDs), Ultra-Wideband Devices (UWDs) and additional spectrum for M2M services, creating opportunities for the public to enjoy benefits from technologies and enabling the industry to build domestic manufacturing ecosystem. India signalled its spectrum plans for 5G services aspiring to adopt the next generation technology as a leading market.In a major policy initiative, which will give impetus to small and medium entrepreneurship in Telecom Sector, DoT decided to deduct payments for resources taken by Virtual Network Operators (VNOs) from telecom service providers, thereby reducing levies payable by VNOs. 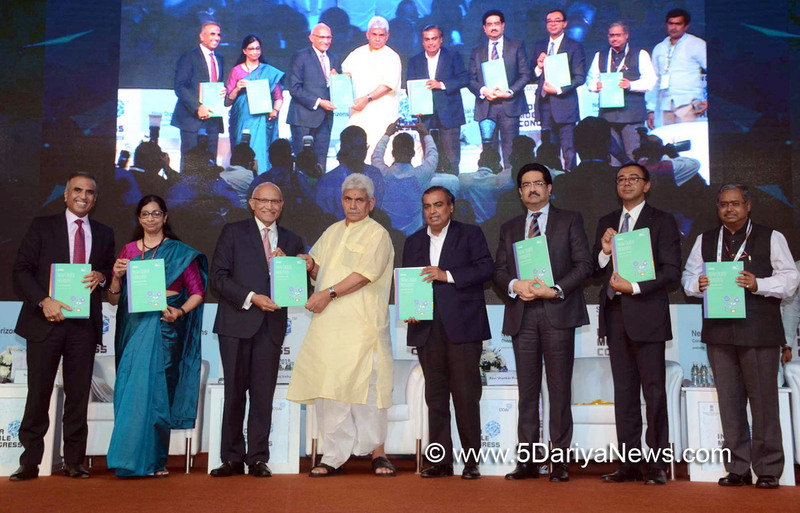 This avoids double taxation at various stages.A concrete plan is in making by the DoT to enable homegrown technologies for trials in the field on a large scale to enable the development and the scaling up of the products and services.The day 1 has witnessed many rousing announcements by the industry and demos of the state of the art 5G applications by global OEMs. Investments of approximately over INR 2000 crores and over 3 lakh jobs are expected to be created.Speaking at the inauguration, Shri Manoj Sinha, Hon’ble Minister of State (Independent Charge) for Communications and Minister of State for Railways, said, “Introducing the second edition of the India Mobile Congress is a proud moment for us. Last year, we witnessed an overwhelming response from everyone and we are confident that IMC 2018 will reach to the next level of success. The country is at the cusp of a digital revolution, with disruptions happening in each and every sector and industry. With growing smartphone and internet penetration and with the finalisation of National Digital Communication Policy 2018, these are exciting times for the telecom sector, and the society at large. We are elated to have the support of the Ministry of Electronics and Information Technology (MeitY) and Skill Development and Entrepreneurship in addition to such enthusiastic participation from who’s who of the industry. IMC 2018, will not only attract investors, it will also witness the launch of several innovative products, encourage emerging startups, and promote futuristic technologies, thereby, paving the path to accomplishing Hon’ble Prime Minister’s vision of a Digitally connected India.”This edition of India Mobile Congress will comprise of ASEAN and BIMSTEC Ministerial Conclave, Partner Programs in Digital India, Smart Cities, Emerging Technologies, Make in India projects, Skill Harmonisation, Business Innovation and Knowledge Sharing. There will be a technology exhibition, offering a peek into connected villages, virtual and augmented reality, connected cars, m-health, smart wearables, smart home, artificial intelligence, robotics, smart energy, internet of things, block chain, and machine learning among other things. IMC 2018 will also hold a special plenary session on upcoming network technologies such as 5G.IMC 2018 will also host a Global CEO’s Conclave where stalwarts from the global technology arena will come together and deliberate on the future of technology and how it will bring about paradigm shifts in the way we go about our daily lives. Discussions will revolve around the power of content, networks of the future, open source technology and emerging technologies.The event will showcase a Digital Village, complete with live experience zones, exhibits on interactive technology, and live demonstration booths on a variety of interesting concepts, hinged around the Internet of Things, Augmented and Virtual Reality, Artificial Intelligence, Robotics, Smart City Solutions, Fintech, Health-tech, Autonomous Cars, and Cyber Security, amongst others.